On the west bank of the river Weser was stretched picturesque city of Bremen, which is considered one of the most interesting, original places in Germany. Its population is approximately 550 thousand. Man, the historical center is surrounded by a strip of green space just on the line, which took place before the old city wall. Here it is situated almost all the important sights of Bremen. The last 100 years, the city strongly developed, it is now regarded not only as a historic gem, but also the center of fast-paced technology, science and technology innovation. 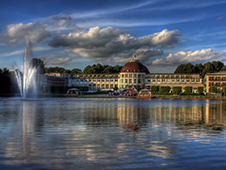 For comfortable travel around the city can use the leased cars in Bremen. The most convenient way to carry out the procedure hire airport, at the train station in the center. To simplify the rental car of any brand in Bremen will order online at bookingcar.ru. Implementation of the rules of the road - one of the main conditions for a successful trip to Bremen. In the process of movement on the road in a car the driver should not use a mobile phone, if it is not provided by a special device that allows you to use the device without hands. Bremen Highway Patrol may charge a penalty to the driver when he picked up a mobile unit while the motor car. The size of the penalty will be 60 euros. The driver of the rental car in Bremen will have to pay a penalty of EUR 30 if at the time of the vehicle front and rear passengers, the owner of the car were not wearing seat belts. Children in the car can travel only if the car is equipped with special restraint systems in accordance with the growth, the weight of the child. Failure to transport the child will cost the driver 60 euros if 2 or more children, will have to pay 70 euros. If the signal "stop" lights up no more than 1 sec. Speeding, especially within settlements, the vehicle owner faces penalties. The amount to be paid depends directly on the index, which exceeded the speed. Parking is possible near the hotel, at Bremen, where a reservation. If we talk about parking on city streets, the easiest way is to use one that is equipped with a parking machine. The device is simple, understandable, as the mechanical clock. Deal with its principle of operation is capable of any driver, even without a thorough knowledge of the German language. The device is designed to position 2, which includes car parking for 30 minutes and an hour. Parking fee depends on what the owner of the car will drop coins into the machine. To leave transport for 30 min., Will have to pay 50 cents. Parking for 1 hour. The driver will cost 1 euro. It is enough to throw a coin into the slot machine. Turn the knob in the direction indicated by the arrow. On the dial, the arrow should clearly show the value of "1 hour". The parking machine you hear a quiet ticking like hours. Most of the driver does not require the time has gone, it can be free of at least the next 60 min.